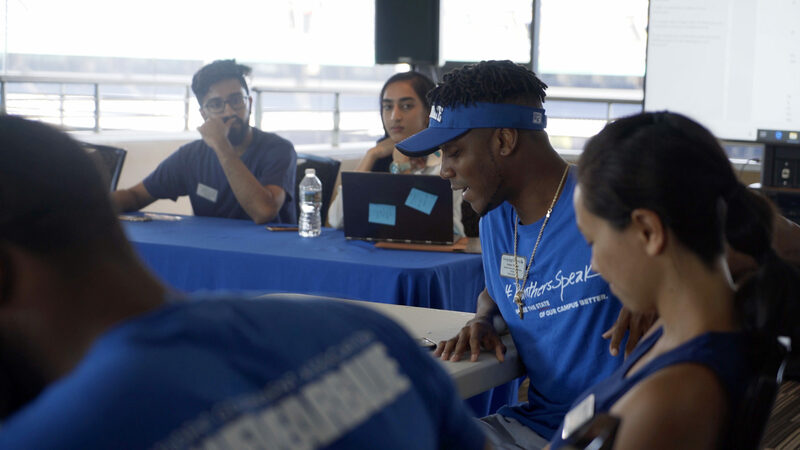 Last Thursday, Georgia State’s Student Government Association (SGA) gathered in a corner of Georgia State Stadium before the university’s opening game to kickoff a game plan of their own. At the meeting, SGA adopted a seating bill that allowed two liaisons, Rachel Disanto and Vivian Chew, to be sworn in as representatives from the College of Law. They were sworn in by Chief Justice for the Student Judicial Board for the Atlanta Campus Gavin Hall. Former Speaker of the Senate Anthony Jones was also sworn in as a senator for the College of Arts and Sciences, effectively retiring from his position as speaker. SGA voted to appoint Spencer Bivins as its representative for the Panther Community Activities Coalition whose primary purpose is to encourage voter registration and voter turnout on campus. The gathering of senators also passed a bill to re-establish the ad hoc safety advisory committee, which was chaired by now-President Franklin Patterson last semester. No senator was nominated and voted as a chair, so the discussion was tabled until the next meeting. The safety advisory committee is responsible for acting as a liaison between SGA and the Georgia State University Police Department (GSUPD). On Sept. 26, a campus safety walk between SGA and GSUPD will take place from 7:30 to 9:30 a.m. beginning at Piedmont North. The walk, which is a result of the safety advisory committee partnership, is intended to identify safety concerns on campus. The university’s transportation department will be meeting with SGA on Sept. 5 to discuss the frequent crowds of students waiting to board Panther Express shuttles in front of Langdale Hall. SGA wants to optimize transportation on campus and has requested that students send in photos of the crowds. A meal plan for commuter students is also in development, according to SGA Senator Jessica Siemer. “It would be a meal plan for students that are on campus three times a week or something like that and you’d be able to use it in retail spaces,” Siemer said. While nothing concrete about the plan was mentioned at the meeting, Siemer did have an idea for how it might work. “It will most likely be a mixture of PantherCash with potentially meal swipes or some variation of that. So what’ll happen is we are going to send a report for what we found and proposed structures for the meal plan in the end of September to get some feasibility feedback from that, then we’re going to ask for some student feedback,” she said. Siemer said the Board of Regents will have the final say on whether or not the plan can be implemented. “The aim is to get it to the Board of Regents by March so it will be implemented by next year,” she said. Senator Kaelen Thomas sparked discussion of a long-debated topic on campus: smoking in Library Plaza. While Thomas made an acknowledgement towards students who do choose to smoke, he was clear in his position on the matter. “Maybe now, as lawmakers and the voice of the student body, we need to take a stand on this issue because the health and wellbeing of many of our students are at risk along with the apathy of the rules of our institution,” Thomas said.